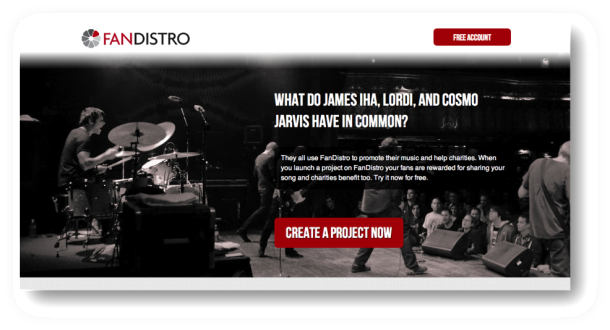 FanDistro is an innovative music promotion platform that rewards fans for sharing an artist’s music by making charitable donations in the fan’s name. The platform was already gaining traction, with many high profile artists using their service, and industry recognition, including being listed as a finalist at MidemLab’s Social Media & Marketing category. Nevertheless, when Venture Harbour began working with FanDistro on increasing their user acquisition, we were able to increase the number of monthly artists signing up by 543% within the first three months of the project. It’s important to note that “we” refers to a team effort between Venture Harbour (with our digital marketing expertise) and FanDistro (with their solid product and ability to implement our recommendations at lightening speed). When we reviewed FanDistro’s user acquisition process, it was clear that the biggest leak in their signup funnel was right at the top: the artist landing page (shown below). This landing page contained too many distractions, had no clear call-to-action, and was very text-heavy – a huge opportunity for improvement. We designed and developed a new landing page for FanDistro that was visually more appealing, contained clear call-to-actions, and effectively communicated FanDistro’s value proposition. 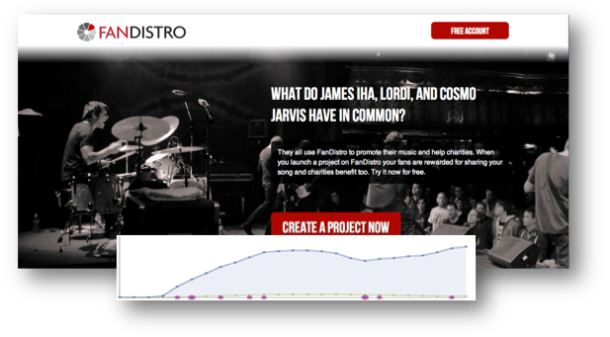 The results from the new landing page were encouraging: an increase in artists signing up from >1% to 9.9%! Now that we had a signup funnel that was converting well, we were ready to shift our focus towards bringing artists to the platform. We set up a broad Facebook Advertising campaign, including page promoted posts, page like ads, sponsored stories, retargeting ads, and standard sidebar ads. Our strategy was to start broad and refine week by week. As we collected and analysed the data from our campaigns, we began to make some interesting observations. As we had expected, page promoted posts were the most effective ad type, with URL ads outperforming image and video ads in terms of driving conversions. Interestingly, our ads were only effective when the bid type, targeting and ad placement were right. We tested CPM, CPC, and all of the oCPM variations for bid type and found that oCPM for conversions (with the conversion pixel installed on the signup page) was continually the most effective way to bid for ads. 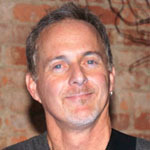 A conversion on FanDistro.com requires an artist to upload audio files. Because of this, we decided not to target mobile users, as most artists are unlikely to upload audio from a mobile device. We tested the various ad placement options that Facebook offers and found that running ads exclusively in the timeline newsfeed was more effective than sidebar ads or a combination of both. Each of our ads was segmented 30+ times into micro demographic ‘buckets’, which enabled us to identify which locations, age groups, gender, and education level converted best on FanDistro. Interestingly, we found numerous instances where 19 year olds converted at <5%, but 18 year olds converted at >1%. By segmenting our ads very finely we were able to distribute our budget into the ‘demographic buckets’ that performed the best. 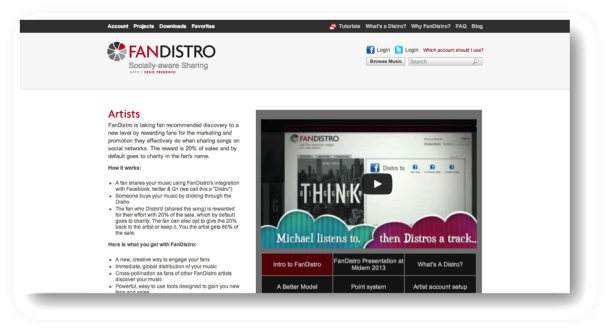 In the space of two months over 1,000,000 artists had been exposed to FanDistro’s ads on Facebook. 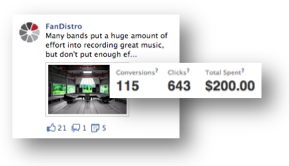 On average, for every $100 we spent on Facebook Ads, we drove 57 signups – each worth $10/year. This meant that we achieved a 470% ROI on our advertising budget, presuming that all signups become active users. Much of the success of this campaign was to down to constantly refining what we were doing and testing everything. From incremental improvements in our targeting, bidding, or ad creative – to much larger changes, such as completely re-designing the signup landing page, we ultimately ended up with a sustainable user-acquisition campaign that continues to improve month-on-month. Start off with bold changes – There’s no point spending hours tweaking little things, when it’s the big things that need attention. By making major changes to FanDistro’s landing page in month 1-2, it meant that our efforts in the following months were ~10x as effective. Use Facebook’s conversion pixel – it not only enables you to track the ROI of your Facebook marketing better, but also enables you to use ‘oCPM for conversions’ bidding, which algorithmically optimises your ads for conversions. Segment your ads as much as possible – we found that in some cases 19 year olds converted 5x more than 18 year olds in the same country. Without segmentation we wouldn’t have spotted this, and thus wouldn’t have adjusted our budget. Use a tool to manage your ads – Facebook’s Ad Platform is extremely limited in terms of functionality. Learn to use the Power Editor or invest in a tool like Qwaya – it’s worth it. Olark – A handy live chat plugin that we installed on FanDistro’s signup pages to enable visitors to speak with us in real time. Can this be replicated for my project? Every project faces its own unique challenges, so it’s unlikely that replicating the specifics of this campaign would deliver the same results. That said, there is no Facebook ad campaign that can’t be improved by segmenting and testing variables like we did, so if you’re already advertising on Facebook, why not run some tests – or work on improving your landing page conversion rates. If you’re not already using Facebook Ads and are interested in trying them, we’d love to help you get started. If you’d like to talk to us about improving your digital marketing strategy, feel free to get in touch and we’d be happy to discuss.